Home>Blog>FAQs Answered: Why do some degrees have Honours (Hons) and others don’t? Continuing to Part 2 of our FAQs series, we bring clarity to the common concepts and misconceptions held by students regarding degree choices. The “Honours (Hons)” Debate is an age-old question, why is there the Honours system and does a degree without Honours (Hons) mean lower salary pay or fewer job prospects? Question #2: WHY ARE THERE “HONOURS (HONS)” ON SOME DEGREES, WHILE OTHERS DO NOT? The BSc (Hons) or BA (Hons) originated in British and US universities. The most common Honours system we know would be that of the British Undergraduate Degree Classification, where the Honours system was introduced in the early 20th century as a method to distinguish different types of students based on their academic achievements. This system has carried itself into other countries, such as Singapore and Canada. All students receive a BSc (Hons) unless the student achieves a passing grade below Honours standard, where he only earns the Bachelor’s degree, but without the honours distinction. The Honours degree typically requiring an additional year to achieve the academic distinction the degree carries. This additional year can be the undertaking of Honours year modules or via the writing of a Bachelor Thesis. For German Universities such as the Technische Universität München (TUM, Technical University of Munich), the UK Department for Education recognises the German Bachelor degree as being equivalent to British Honours degrees, meaning that a German BA or BSc is equivalent to a British BA (Hons) and BSc (Hons). TUM does not employ the Honours systems, but in all of TUM’s Bachelor degrees students are required to complete their Bachelor Thesis as part of the graduating requirement, not merely for those who opt for the Honours year. 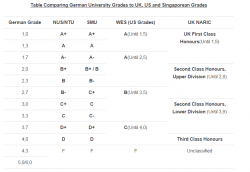 As shown in the comparison chart on the right, a 3-year German degree holds itself equal to 4-year degrees in certain universities/countries. The credits and modules covered in the programme itself may be as important – if not more important – than the duration itself, when making choices.